ashley, kimberly, and i are back for this week's double header. 2 nights of the bach is a lot of tv for me in 1 week. this season is killing me...in more ways than one. i don't have a ton to say about the hometowns. nikki...she really really wants to tell juan pab she loves him, but never does. am i the only one that just learned missouri is cowboy land? my parents live in missourit (on the other side), and i've never thought there were lots of cowboys. andi...lots of awkward. andi is willing to risk getting her heartbroken and feels close to being in love. her family was awkward about the whole thing, and i feel sad for her. i still think she is way too good for him. renee...if juan pab had 1/2 a brain he would keep renee. she's really chill and seems like a good fit. her fam is cool, and she's so cute with her son. clare...crazy clare obvi gets it from her crazy fam. i have no idea what happened with her mom and her sister except i don't think her mom speaks english. is that even possible? why doesn't clare speak spanish? why don't any of the girls speak spanish since juan pabs clearly doesn't speak english well. they all go back to miami. nikki looks a little rough. renee gets the boot and she is probably the least ugly crier the bach has ever seen. she was also the best dressed along with andi who kills it every single time. clare's dress wasn't my fave. clare...love talk starts right away. she says "love" 3x in the first 60 seconds and 17 times on their date. still no "i love you" though. after the ocean we all know she's going to spend the night so i'm really confused why she acts like she's not. juan p tells clare he has to make sure he doesn't make a mistake, and my jaw drops that he would actually say that (possible language barrier...prob not). they talk about the future except not really. it's super vague. juan p asks "why are you thinking so much?" and i wonder why he isn't thinking that much. clare's duck face is.killing.me! andi...andi is wearing the perfect island attire, and juan p is not. men, do not wear tanks. women, do not let your men wear tanks...ever! they play the drums, eat, soccer, etc before discovering a waterfall. they are going to make out...obvi. her 1 piece swimsuits are killer...like the rest of her clothes. they talk a little about what they are thinking, and all the rest of us are thinking andi better be the next bachelorette. andi says she can't stop smiling and i remember clare can't stop making duck face. juan p is super happy and loved the over night, and andi thought it was a nightmare and disast..clearly not on same page. 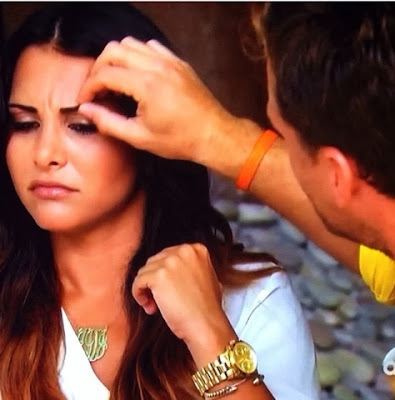 andi says "i'm not an idiot", and she's clearly showing she's way too smart/good for him. also she better be the next bachelorette. she also says "he doesn't get it", and she finally realizes what i have been saying about him the whole season. also as a random sidenote, the bach really needs new music. nikki...most confusing dresser. some people are going to rave about her outift, but i hated it. she's in lala land and loving life. juan p tells her this is real life, and i want to remind her it is tv. they ride horses and everyone is glad she is wearing pants, and i'm pretty sure juan pabs is picturing nikki in her underwear or less. they have dinner and hit the fantasy suite where nikki is the first to say "i love you.". i might be wrong, but i really think it's nikki in the end, and i think if they are still together, they won't be in a month. andi is pretty upset with juan p, and we have an argument between an attorney and someone who doesn't speak english. no wonder all he said was "it's ok." i've known this whole time that andi wasn't the right fit for him for this very reason. she's too good and too smart. andi for bachelorette! she leaves and talks about finding love, and i'm pretty sure they are setting her up for next season. clare and nikki are left, and they are totally confused. poor nikki just lost her BFF and is now stuck with the girl she hates. good thing they don't see each other again after this week. holy moly i had more to say than i thought. i can't wait to see what happens next week. kelly, dog lover, is my new fave. follow her on twitter immediately. i can't wait to see what everyone else has to say. what did you think of this week? link up if you wrote a post. Chirs Harrison has totally been MIA this season. Maybe he's doesn't like JP. I hate Clare's duck face!!! I was wondering if I was the only one who noticed it! I'm so gald you found a picture of that whole eyebrow picking thing. What was that? And he tells Nikki he wants her to ride a horse in a thong?! Last night's episode killed me!!! Oh my gosh... any time anyone looked like they were thinking about something big (so like twice), he asked them why they were thinking so much?! Is it a crime to think?! Oh, I forget, you'd rather just make out. And he was so rude to some of them and they just didn't realize it, but Andi calls him out on it and he blames the language barrier... um... no... that's not a legitimate excuse to pull out of your pocket, sorry dude! I loved Catherine and Sean on Twitter last night... haha, since we were just talking last week about how Sean was one of the most down to earth, real guys they'd had on the show! ANDI HAS TO BE THE NEXT BACHELORETTE!! Seriously though. I love her. I so respect what she did last night....she could have easily been like, "yay! Everything is great" but she didn't. I ditto the Andi for next Bachelorette!! Juan P doesn't seem attached enough to the girls. Remember Des when Brooks left? Allie when Frank left? The Mesnik? This late in the game, you should be emotionally attached enough the girls that you show more emotion than "oh it's ok" if the choose to leave. THAT I think makes him shallow. Which is what Andi was saying. Communication is obviously ultra important in a relationship. He doesn't get that. Despite the language barrier. I can't see him engaged, let alone married at the end of all this. I want them to take someone totally random instead of a past contestant from the show!